Sympathy has been almost universal for sacked Manchester City manager Mark Hughes and it is clear that the club's Abu Dhabi backers are taking a huge gamble turning to Roberto Mancini, who has no experience in English club management and will be given precious little time to adapt. 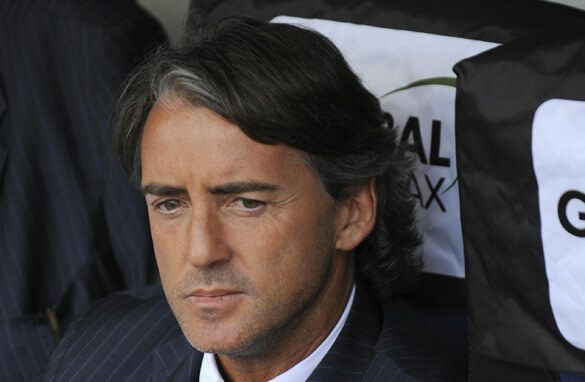 Mancini must hit the ground running in his new job at Manchester City. It's a gamble because Mancini has been out of the game for almost a year after departing Inter, having won three Serie A titles but failing to make an impression in the Champions League. It's a gamble because they are presumably entrusting him with more millions in the January transfer window to shore up a leaky back four and make a final push for a Champions League place. It's a gamble because several of the players who have flourished under Hughes, such as Shay Given and Craig Bellamy, are clearly in open revolt over the manner of his dismissal. And it's a gamble because most expected Hughes to be given until the end of the season and if he failed to be replaced by Guus Hiddink, or even Jose Mourinho, both of whom with a track record in the English Premier League. Admittedly, his critics will say Hughes had enough time at City and had been bankrolled to the tune of $200 million to deliver results, but even the most hard-hearted must agree that the City board grossly mishandled his departure. Because even by comparison with other disgraceful sackings, and I have in mind the treatment afforded to Martin Jol at Tottenham, this was shabby in the extreme and showed a distinct lack of "class" by the City board. Hughes has quickly broken his silence to reveal that he had no real idea he was on his way, despite the media speculation, and was "extremely disappointed." I suspect that's an understatement and the suspicion that Mancini had been lined up for several weeks must leave a sour taste in his month. Other managers, even Arsene Wenger, who refused to shake his hand after City had denied his side a place in the English League Cup semifinals, have expressed their opposition to the sacking. Hardly surprising because turkeys don't vote for Christmans and managerial solidarity remains strong in the topsy-turvy world of the Premier League, but there is a feeling that this is a sacking too far and will lead to fresh doubts about the role of "foreign" owners in English football. It will be hardly reassuring to Mancini that he will have to deliver results in double quick time and if Hughes had some advice for the suave Italian it would be don't believe a word the owners tell you. According to Hughes, he was set a target of finishing in the top six and Saturday's win – admittedly only the second in 11 Premier League games with a raft of draws – had left them in sixth. Add the small matter of the League Cup and the chance of winning silverware for the first time since 1976 and it is easy to see why Mancini has a mighty task on his hands to satisfy a group of businessman who view footballing success as a commodity which can be bought. They're wrong, of course, and might do well to heed words of advice from the great Alex Ferguson, who has steered City's neighbors to trophy after trophy for two decades and has often warned that money does not guarantee succcess. "The art of management is building a team with balance, with certain characteristics that blend with each other," said Fergie on 2008. Quite. The departure of Mark Hughes is another gaint hole in the image of English Management.On the other hand,the Abu Dhabi -who i think may never find a team builder like Mark-regardless of how good the new boss is.the main point is:You can't buy titles in the best league in the world,as Fergie said,it takes far better than cash to get a silver wear England. I'm 17yrs old-10yrs watching 8games a week- i have to say Mark is one of the best manager in England.his work at BB.Rovers is a good example of his capabilities out of nothing promising really. Lastly,i think the group's new manager can't make any impact really.lack of effective communication to his players is one of several problem along with precious time.they were dead wrong sacking Mark,only time would tell. Mark needed more time,He was in an important step in building a perfect team.his multi-million dollar players berly know each other.his successor would find it even more difficult knowing what a change in the management of a team brings to the dressing room. i believe mark hughes is a failure sort of. For the owners of the club to have spent such huge amount of money on players, i think they deserve the best. this mark hughes can not provide. in 11 matches he only won 2 . the club should have contracted a world class coach at the begining of the season instead of allowing mark hughes to pursue his pipe dreams. although i don't expect much from mancini i think he is better than hughes. Hallo ! This is an Italian Fan of Milan AC. As a soccer fan I was really disappointed by the treatment given by the City's owners to Mr. Hughes. I do believe he didn't deserve to be treated like that ! When a soccer team has to be build up, time is needed exactly as money is needed ! Also I say: does it make sense doing something for the team which is not agreed at all by the team itself ? I have been a fan of City since the club was controled by Takshin and over the years there has been great improvement in the club's performance and of course selling the club to Abudabi was a greater idea for the fans much was expected from the club with good players and the club is now at 6th place. I believe the ability to achieve 6th place in the EPL is no joke and all the credit should go Mark Hughes... he did a great jod and I don't think a person like him should be told to leave in that manner. Fans are wondering what's going to happen to the club in the event next season we don't reach the 4th place: Mancini think about it!! !